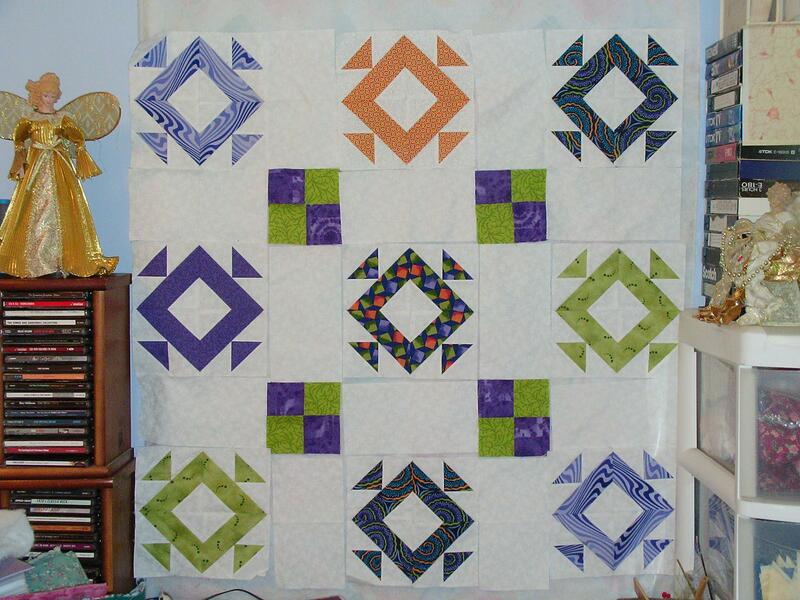 Mary Johnson posted a HeartStrings quilt on her blog that features 4-patches as alternate blocks for sawtooth stars. It’s very pretty, and it started me wondering what my purple-green-orange quilt would look like with 4-patches. None of these blocks are stitched together yet. This looked pretty good at 2 0’clock this morning, but now I’m not so sure. This is the random block arrangement from this sketch. I got a “reprieve” on the two quilts I was trying to finish for Christmas. The recipients are going to be out of the country for the holidays, and we won’t be seeing them again until Easter, so those two projects have moved down the list a bit. Now I can do some no-stress UFO finishing. If I could just figure out what I want this quilt to look like. I’m probably thinking about it too much. 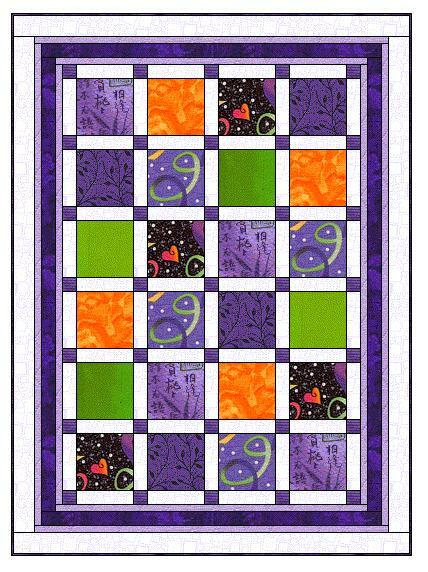 To see what other quilters have on their Design Walls today, please visit Judy’s blog. I love the blocks in either setting, but I have to admit I’m a sucker for 4 patch blocks. I think I love them because they are such a no-brainer that even I usually can’t mess them up. I love the way you used the scraps in Nigel’s quilt. Okay, I love the four patch blocks also. Adds interest! Very nice! Well, aren’t you the luckiest quilter getting a reprieve from not one, but two Christmas quilts! I am so jealous. I don’t think they work as well here as they did in Cheryl’s quilt because in hers, they created a chain when set next to her other blocks here they’re just kind of sitting in the middle but aren’t connected to the other blocks in any way. I think a narrower sashing with cornerstones like in your drawing would look better with these blocks.